America’s Cup: we sail on board the GROUPAMA AC45 Test FAST AND FURIOUS! The aft unit of the AC45 Turbo Test in action! By the time you read this, there’ll be less than 130 days to the start of the 2017 Cup in Bermuda. To whet your appetite and kick-start your desire to check out exceptional pictures, here is the report from the Lanveoc base of the latest trial sails in December 2016 from on board the AC45 Turbo Test catamaran. A unique and amazing experience! Create a notification for "America's Cup"
Baron Marcel Bich mounted four challenges (1970, 1974, 1977 and 1980), which were self-funded, but unsuccessful. Marc Pajot undertook three campaigns (1987, 1992 and 1995), but didn’t get beyond the semi-finals; Stéphane Kandler entered the arena too late to figure honorably in the 2007 edition. Next, Loïck and Bruno Peyron tried to fire up some French enthusiasm for a challenge, but without success. 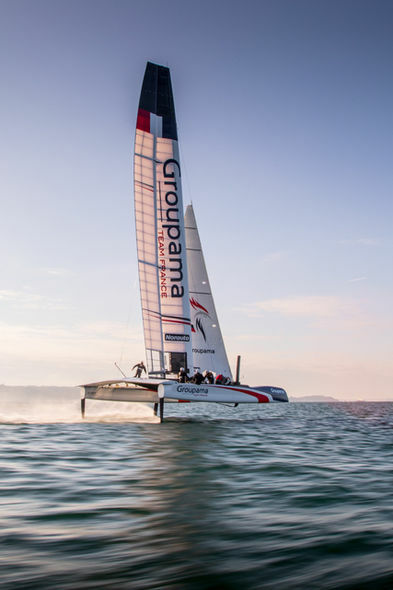 Finally, in 2015 at the Hôtel de la Marine in Paris, Franck Cammas, Olivier de Kersauson and Michel Desjoyaux unveiled their challenge and their title sponsor: Groupama Team France. Despite the absence of any compelling sporting result, previous entries served to maintain French enthusiasm for the race at a very high level and to shape two generations of the country’s match racers. 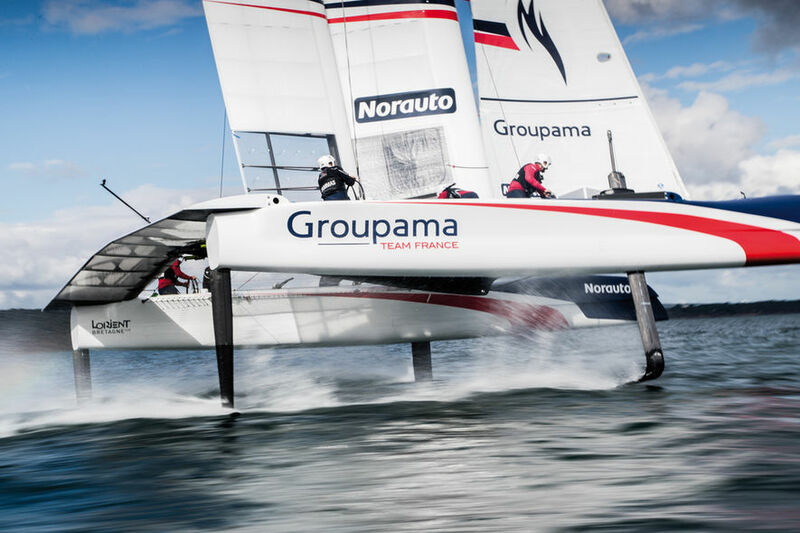 But it’s the conversion of the America’s Cup to multihulls which has propelled (discretely) French sailors and technicians to the reactor core. Shanghaied by several challenges, they’d been involved with the Cup for too long not to be influenced by its charms. But are they on the verge of bringing home the Cup? Franck Cammas is the embodiment of a mix of brilliant offshore multihull racing culture, the amazing creativity generated by the Formula 40s, the Orma 60s, the Jules Verne Trophy, the Ultimes and Olympic classes of sports catamarans or Class C.
The creative explosion brought about by the switch to multihulls has both totally turned the race on its head, and opened the doors to worldwide TV audiences. The traditional, hyper-tactical monohull matches (the J-Class and the 12-Metres) remained both incomprehensible and uninteresting to the general public: the peculiar multi/mono challenge in 1988 between Stars and Stripes (a 60’ cat) and New Zealand’s KZ-1 (a 27m monohull with 30 crew) completely clouded the picture; the strange duel in Valencia in 2010 (the 90’ BMW Oracle trimaran, USA-17, against the Swiss catamaran, Alinghi) was little better, though it did see the discovery of a rigid 50m wing sail on a 30m tri! But we had to wait until the extraordinary spectacle of the AC72s in San Francisco before this sailing phenomenon reached screens beyond those of a circle of enthusiasts. The transition toward the semi one-design format of the AC45s (and now AC50s) persisted, and this allowed for research and development favoring sporting prowess on these extraordinarily innovative and spectacular boats whose speed on the water (potentially 40 to 50 knots) and agility make up the DNA of a new global Formula 1 circuit, close to its audience, and compact and easy to understand. Extreme Sailing Serie - Live from Barcelona! America’s Cup: youngsters and news!